"Insane Tiger 虎痴 (hǔ chī)"
Long-serving bodyguard of Cao Cao 曹操, Xu Chu was said to be a huge person. His height was about 2 meters and his waist 52 inches. Probably one of the 20 most famous characters in Romance of Three Kingdoms, he has significant air-time in the story for the many instances that stood forth to protect Cao Cao. His combat ability was reputed to be on par with Zhang Fei 张飞, Guan Yu 关羽 and company. His moment of glory came in the fictional account of him stripping off all his armour for his fight with Ma Chao 马超. This bravado mixed with insanity helped him secure a place in history. 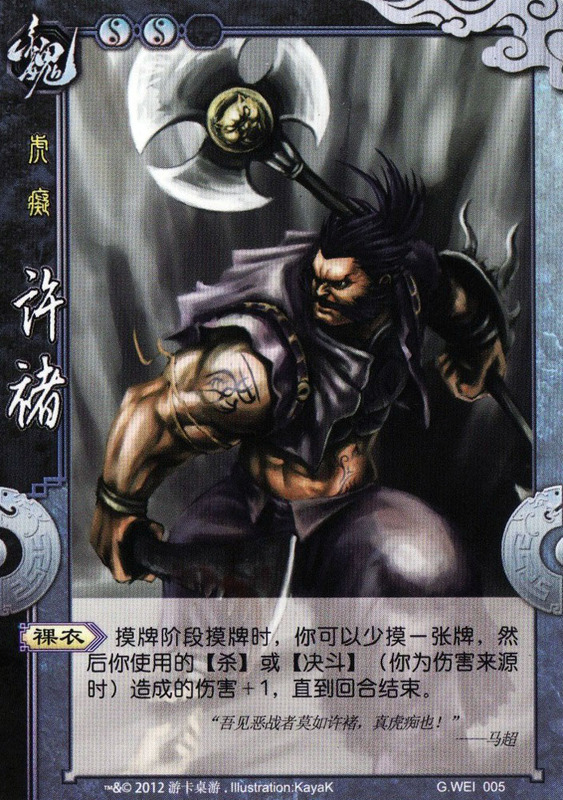 Character ability: "Bare-Chested 裸衣 (luǒ yī)"
During your drawing phase, you can draw one card less so that the damage inflicted by your ATTACK 杀 and DUEL 决斗 (when you are the source of damage) is increased by 1. This effect lasts till the end of your turn. In his duel with Ma Chao, the two generals were fairly matched for over a hundred rounds. Xu Chu then momentarily backs off, strips off all his armour, then goes back to continue the duel bare-chested! This act of madness is followed later by his discarding his sword and grabbing Ma Chao's spear under his armpit. The ensuing struggle snaps the spear in two. The two then hack at each other with their halves of the broken spear. No wonder that Ma Chao later describes Xu Chu as a tiger gone insane.